Plate tectonics is a theory of geology. It explains movement of the Earth's lithosphere which is the earth's crust and the upper part of mantle. The lithosphere is divided into several plate, some of which are very big and can be entire continents. Dissipation of heat from the mantle is the original source of energy driving plate tectonics. Exactly how this works is still a matter of debate. The driving forces of plate motion continue to be active subjects of on-going research. The outermost part of the Earth's interior is made up of two layers. The lithosphere, above, includes the crust and the uppermost part of the mantle. Below the lithosphere is the asthenosphere. Although solid, the asthenosphere can flow like a liquid on long time scales. Large convection currents in the asthenosphere transfer heat to the surface, where plumes of less dense magma break apart the plates at the spreading centers. The deeper mantle below the asthenosphere is more rigid again. This is caused by extremely high pressure. 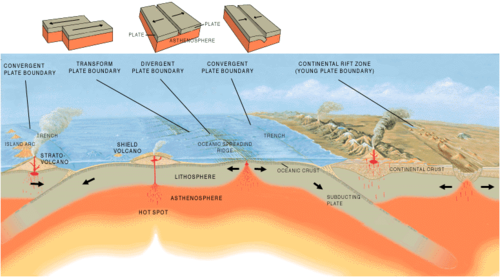 There are two types of tectonic plates; oceanic and continental. An oceanic plate is a tectonic plate at the bottom of the oceans. It is primarily made of mafic rocks, rich in iron and magnesium. It is thinner than felsic, continental crust, generally less than 10 kilometers thick; and denser. It is also younger than continental crust. When they collide, the oceanic plate moves underneath the continental plate because of its density. As a result, it melts in the mantle and reforms. The oldest oceanic rocks are less than 200 million years old. Continental plate is the thick part of the earth's crust which forms the large land masses. They are mostly granitic rock with its abundant silica, aluminum, sodium and potassium. Continental plates take long time to form but are rarely destroyed. Its oldest rocks seem to be 4 billion years old. Oceanic plates cover approximately 71 percent of Earth’s surface, while continental plates cover 29 percent. Continents have lower density. Ocean lithosphere varies in thickness. Because it is formed at mid-ocean ridges and spreads outwards, it gets thicker as it moves further away from the mid-ocean ridge. Typically, the thickness varies from about 6 kilometres (3.7 mi) thick at mid-ocean ridges to greater than 100 kilometres (62 mi) at subduction zones. Continental lithosphere is typically about 200 kilometres (120 mi) thick, though this also varies considerably between basins, mountain ranges, and stable cratonic interiors of continents. The two types of crust differ in thickness, with continental crust being considerably thicker than oceanic: 35 kilometres (22 mi) vs. 6 kilometres (3.7 mi). The lithosphere consists of tectonic plates. There are seven major and many minor plates. The lithospheric plates ride on the asthenosphere. Plate boundary is where two plates meet, and where movement occurs, after which they can create mountains, earthquakes, volcanoes, mid-oceanic ridges and oceanic trenches, depending on which way the plates are moving. Convergent boundaries: two plates move towards each other. Sometimes one plate will move under the other. This is called subduction. When an Oceanic plate collides with a continental, the oceanic plate will move underneath the continental because it is denser. Convergent boundaries can make mountains and volcanoes. The Andes mountain range in South America and the Japanese island arc are examples. Also the Pacific Ring of Fire. Divergent boundaries: two plate move apart. As shown in the diagram, the place where the boundary occurs is called a rift. Magma from the mantle pushes up and cools off forming new land. They make earthquakes and trenches. The Mid-ocean ridges and Africa's Great Rift Valley are examples. Transform fault boundaries: two plates move side to side. They make earthquakes. The San Andreas Fault in California is an example of a transform boundary. New Zealand is another, more complex, example. 1–4 centimetres (0.39–1.57 in) per year (Mid-Atlantic Ridge). This is as fast as fingernails grow. 10 centimetres (3.9 in) per year (Nazca Plate). This is as fast as hair grows. ↑ 1.0 1.1 1.2 Turcotte, D.L. ; Schubert, G. (2002). "Plate Tectonics". Geodynamics (2 ed.). Cambridge University Press. pp. 1–21. ISBN 0-521-66186-2. ↑ Rolf Meissner 2002. The little book of planet Earth. New York: Copernicus Books. p202 ISBN 978-0-387-95258-1. ↑ Huang Zhen Shao (1997). "Speed of the continental plates". The physics factbook. ↑ Hancock, Paul L; Skinner, Brian J; Dineley, David L (2000). The Oxford companion to the Earth. Oxford University Press. ISBN 0198540396. Movie showing 750 million years of global tectonic activity. More movies over smaller regions and smaller time scales. This page was last changed on 4 March 2019, at 21:39.